* Easily mounts inside your own instrument panel. Exclusively for X-Plane, P3D and FSX/MS2004 Users! A number of customers asked if we can come up with a Cessna Panel that has a Beacon Light Toggle Switch so as to better simulate the 172 panel seen in FSX and also be compatible with BOTH FSX and X-Plane. With some time on my hands, I redesigned the popular Model 1010 to add about 1 inch to the overall length of the panel to accomodate the extra switch. Using all the Features of the Model 1015, the 1019 has the looks and feel of the 1015; its 5 Position Key Switch (with 2 keys), Dual and Single Rocker Switches to control your Alternator/Bat and Avionics. And the standard battery of switches for all your aircraft's lights; now including the Beacon. Also Supports BOTH FSX and X-Plane. Using all the Features of our Classic 1015, the 2625 has the looks and feel of the 1015; its 5 Position Key Switch (with 2 keys), Dual and Single Rocker Switches to control your Alternator/Bat and Avionics. The 2625 now includes 7 Mini Rocker Switches to control all Lighting, Fuel Pump and Pitot Tube Heat functions. The IRS Series of Cessna Panels is now available with lighted MASTER Alt/Battery and MASTER Avionics Rocker switches. Just by Flipping the rocker into its UP position, not only performs its programmed flight function, it also lights up an internal light bulb. Powered by your computer's USB Port, there is no additional wiring or programming. Please Note: While your computer's USB Port can support a small number of light bulbs, it is recommended that a Powered USB Hub be used if your flight panel contains a large number of LEDs or Light Bulbs. Power Hubs can be found on the internet. Classic 1019 and 2625 in exchange the the IRS Panels. 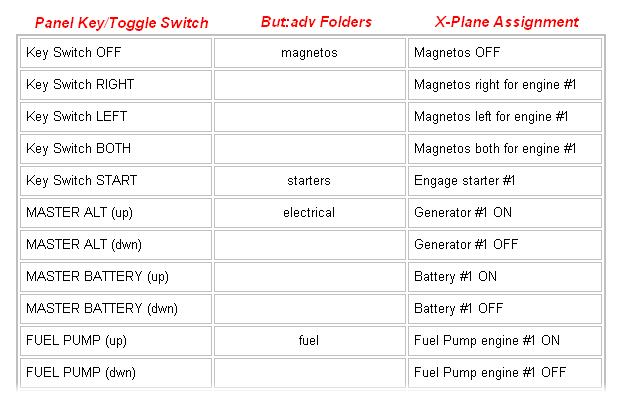 Using these commands eliminate the Out-of Sync switch problem that can be found using the "Toggle" commands. All of the 28xx's switches make use of this more convient and reliable configuration. 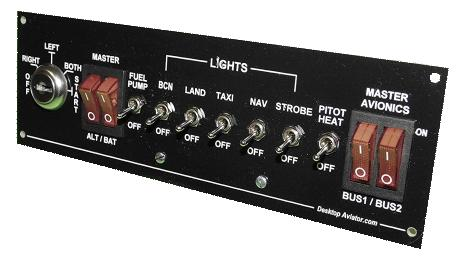 The 28xx panels are available in ALL Cessna Panel Configurations; including the Toggle Switch version (1019); the Rocker Switch (2625) and the Illuminated Rocker Switch (IRS version).